Animal Aid Unlimited does it again! A young boy in India found a three-month-old puppy stuck in a thick layer of tar near a road that was being repaired. The young rescuers pulled the puppy from the road and called Animal Aid Unlimited. Volunteers worked for hours rubbing vegetable oil on the puppy’s body to remove the tar. They then bathed him with soap and water. This treatment was done four times until the puppy was completely free of tar and ready to start his new life. Animal Aid Unlimited runs a vital emergency rescue service for street animals—dogs, cows, donkeys, birds, and cats—in Udaipur, Rajasthan, India. Their rescue team respond to up to 50 calls every day, rescuing animals with fractures, spinal injuries, wounds, skin problems, and other diseases. Rescued animals are brought back to their shelter where they are treated by medical team and care-givers. They perform emergency surgeries as well as spay/neuter. On any given day they treat around 150 recovering animals in their shelter. The Animal Aid Sanctuary is home to animals permanently disabled from accidents, fragile, blind, and those in need of long-term medical care. 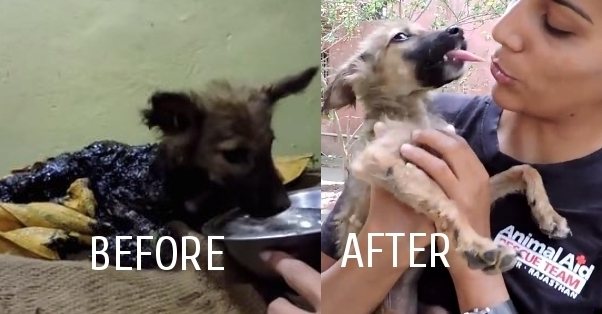 They have given permanent sanctuary to over 150 disabled and special needs dogs, 40 cows and bulls who were left to die on the street by dairy farmers, and over 30 handicapped donkeys rescued from abusive owners. Responses to "Puppy Covered In Tar Gets Most Beautiful Rescue"